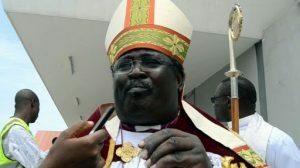 Bishop of Ibadan Diocese Church of Nigeria, Anglican Communion, Reverend Joseph Akinfewa has voiced out his frustration on the consistent recycling of Nigerian leaders who tell the same stories to electorates during elections after many years of independence. Akinfenwa relayed this to newsmen on Sunday after the international ordination service and licensing of Lay Readers at the All Souls’ Church, Bodija, Ibadan, Oyo State. He also added that Nigerians need to pray to God for the forthcoming election saying, “All we need as Nigerians is to pray to God to give us security in the land and in 2019 elections and to make His judgment to bear because all the money they are using now to campaign, is it not our stolen money that they are using to bribe people to vote for them? We need to pray to God to bring down judgment. “It is an injustice and a daylight robbery. And all we have to do is to pray for a messiah. We need a revolution. God should revolutionize this land. We are tired of the same people doing same thing all the time. It doesn’t matter the personality or a particular political party,” Akinfenwa added. During the ordination of new ministers of God, the Bishop implored them on the need for diligence and faithfulness in the service of God.